2018	Cooper Scholar, 20th International Workshop on Co-Morbidities and Adverse Drug Reactions in HIV. 2018	New Investigator Scholarship, Conference on Retroviruses and Opportunistic Infections (CROI 2018). 2017	Mentoring Workshop for Junior Investigator Scholarship, HIV & Aging: From Mitochondria to the Metropolis. 2017 Young Investigator Travel Scholarship, 8th International Workshop on HIV & Aging 2017. 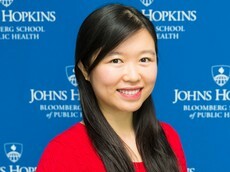 2012 Student Research Award, American Public Health Association, Public Health Education and Health Promotion Section. 2017	Conference Travel Scholarship, Johns Hopkins University Department of Epidemiology. Sun, J., Brown, T., Samuels, D., Hulgan, T., D’Souza, G., Jamieson, B., Erlandson, K., Martinson, J., Palella Jr., F., Margolick, J., Kirk, G., Schrack, J., The Role of Mitochondrial DNA Variation in Age-related Gait Speed Decline among Older HIV-infected White Males. Clinical Infectious Disease, 2018. Sun J, Patel F, Rose-Jacobs R, Frank DA, Black MM, Chilton M. Mothers' Adverse Childhood Experiences and Their Young Children's Development. American Journal of Preventive Medicine. 2017.